Up until a few days ago, I would have told you Stapelias are my favorite cactus. However, during my research for this post I learned something surprising: Stapelia is NOT a cactus! I repeat, the Stapelia plant is not a cactus. After all these years of having this plant and raving about it to people, just imagine the sound of tires screeching as my brain came to a halt... Whaaat? Not a cactus?! No way. As you can imagine I quickly stumbled into an internet rabithole of information in search of the truth. Now that I've cleared that up, let me just say that there is a great deal of misunderstanding and misinformation out there on the world wide web, the internets is a free-for-all where everyone and their grandma can write whatever they want about anything. 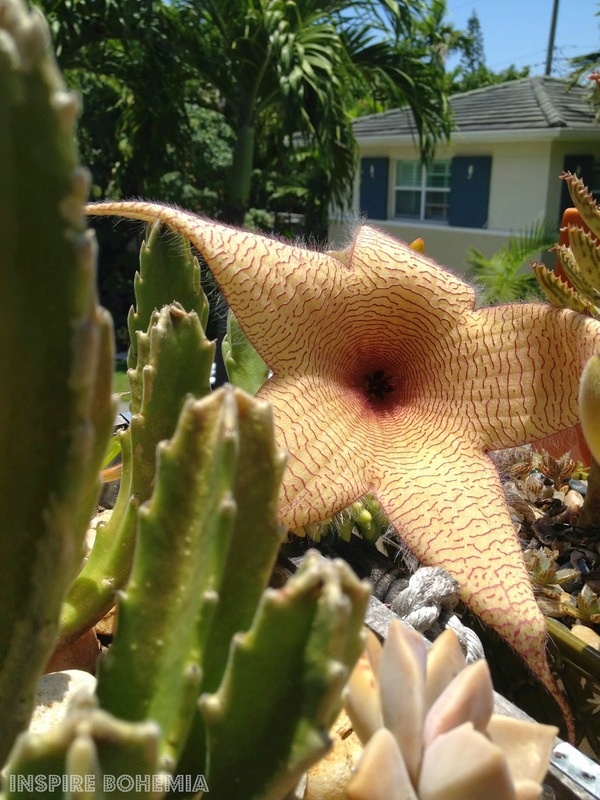 For the most part, wherever you see "Stapelia" you see "cactus." It's for this reason that I am trying to be as accurate as possible when discussing my plants, so please don't hesitate to let me know if I ever get something wrong. Apparently, Stapelias qualify as perennial succulent herbs. They're part of the Milkweed subfamily Asclepiadoideae, which is in the family of flowering plants known as Apocynaceae - commonly known as the Dogbane family. If you love succulents and cacti you must remember this: all cacti are succulents, but not all succulents are cacti. This means that succulents are found in many plant families, not just the Cactus family Cactaceae, and the Stapelia is a perfect example. "All cacti are succulents, but not all succulents are cacti. 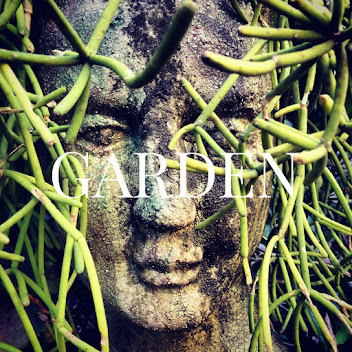 Succulents (from the Latin word “succulentus,” for juice or sap) are defined by their moisture-storing capacity and come from many botanical families... Cacti have small, round, cushion-like structures called areoles from which spines, branches, hair, leaves and even flowers grow. While many succulents may look like cacti in every other respect, if they don’t have these circular areoles, they are not in the cactus (Cactaceae) family." The name Stapelia was first introduced in 1737 by Carl Linnaeus, a Swedish botanist, physician and Zoologist, as a way to honor 17th century physician and botanist Johannes van Stapel. Commonly known as the African Starfish or Carrion Flower, Stapelias are perennial succulents native to the arid regions of tropical and Southern Africa, where some 43 species grow. By now you might be wondering, ok so what makes this Stapelia plant so darn wonderful? The answer is: soft succulent velvety stems, no pesky spines (because it's not a cactus, what a revelation! ), rapid growth, easy maintenance, and most importantly - downright fascinating flowers! Now, one thing you may have heard about this plant is that its flower stinks. Indeed, its smell and everything about its appearance (color, hairs) is meant to emulate rotting flesh in order to attract flies for its pollination (which in reference to pollination by flies is called myophily, or on a broader scale of insect pollination - entomophily). Hence the nickname carrion - which literally means the decaying flesh of animals. However, I must insist that the smell is not that bad, so please don't let that deter you from adding one (or 20) to your garden. I have this plant all over my backyard and it puts out several blooms at a time, the only time I've ever caught a whiff of its unbecoming odor is when I got very close to it. One day, I was telling raving to someone about this plant and they told me that they didn't like it because of the smelly flowers, at which point I went home and intentionally smelled the flower to see what the big deal was. I'm telling you right now: it's not a big deal at all, and it's certainly no deal breaker for me! The beauty of this plant far exceeds its unflattering biological characteristics. After reading more about the Stapelia genus, I found out that the species erectiflora and flavopupurea actually have sweet smelling flowers. Stapelia flavopupurea is gorgeous and I can't wait to track one down for my collection! Anyway, Stapelias love sun and bright light, and they thrive in rocky sandy soil, which makes them perfect candidates for rock gardens. This succulent is drought resistant and is better off being underwatered than overwatered, especially since it's vulnerable to root rot and mealy bugs if the roots remain damp too long. However, make sure to water this succulent at the first signs of shriveling in its stems as it will not be able to bounce back after a certain point of drying out. Overall, I'd say this is a very hearty succulent that's constantly forming new growth and extremely easy to propagate. During the Fall and Winter months, Stapelias bloom constantly (at least mine do), in fact it seems like they're always blooming year round. So far, my collection includes five different Stapelia succulents. At least I think so, since several did not come labeled at the time of sale, therefore I've done my best to ID them according to garden sources on the web. Scroll on for photos of my collection, and remember: Stapelias are a succulent, but that doesn't make them cacti. Do you have a Stapelia succulent plant? If so, please feel free to share photos and/or tips below in the comments, I'd love to hear from you! Check out this cut sheet from the University of Florida for more specific details on the Stapelia plant. This is the Stapelia succulent that I have growing in abundance throughout my garden, I believe it's Stapelia hirsuta. I used to think it was a Stapelia grandiflora, but one day I was photographing two different planters with this succulent in it, both flowering and sitting side by side, when I noticed they each had unique color patterns. Stapelia asteria is very similar to grandiflora and hirsuta, so to be honest - I'm not sure which is which. Did I mention these flowers are hairy? Yep, they're fuzzy! 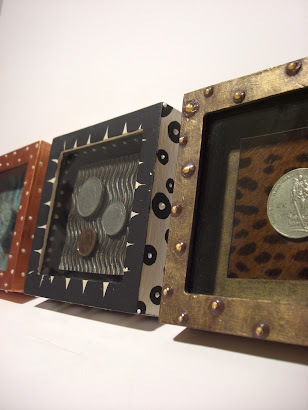 You can see what I mean about the color variations in the photos below... The flower on the left has less color contrast and fades off at the tips, whereas the flower on the right is very dark burgundy at the tips and shows more prominent contrast between the creamy yellow and burgundy striations. Exactly opposite are the flowers in the photo up above, which appear to be burgundy pink in color with creamy white striations. Also, I don't know if it makes a difference that its petals are more curled back and appear to have more hair. Either way, each of these three Stapelia succulent flowers are slightly different which leads me to believe they are not all grandifloras or hirsutas or asterias. The question is, which one is grandiflora and which one is hirsuta or asteria? To be honest, I wouldn't mind knowing, but I love them all regardless of this uncertainty. I'm not certain of the name of my latest Stapelia find either (see below). 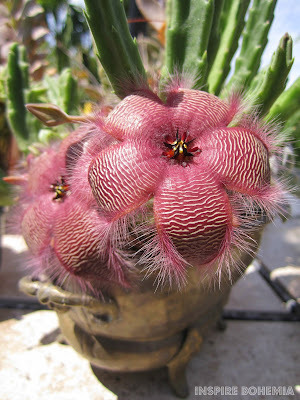 Its flower is a lot lighter in color and the succulent itself is chunkier and has a slight pink tone at the edges - which is similar to Stapelia gigantea. This stunner is Stapelia leendertziae! Wow, what a beauty, its large blood red bell shaped flower is stunning. I can't wait for this one to grow and spread more so it can produce lots of flowers all over the garden. As you can see, both of these succulent Stapelia flowers are quite unique, the overall shape and color patterns tell me they're likely two different species. The one on the right came marked as Stapelia scitula, the one on the left was unmarked and bought years later. 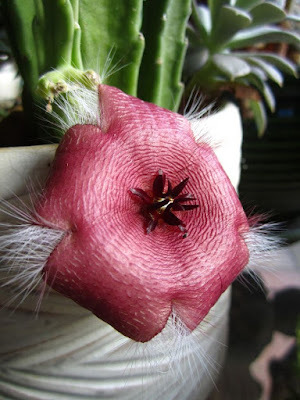 I've also seen Stapelia scitula referred to as Stapelia paniculata, so once again - uncertainty. If anyone out there can provide some clarification I'd really appreciate it!